It seems likely President Trump will have several major battles on his hands over trade. After a bit of a rally earlier in the week, the global markets have tumbled again in response to renewed concerns regarding trade. After the initial enthusiasm over comments by Trump and Director of the National Economic Council Larry Kudlow, there has been a slide in confidence. It has become obvious that no real agreement came out of these meetings—just willingness to talk some more. The statements by Trump regarding Chinese intent turned out to be premature and not very accurate. At best, it was a statement that suggests they will both keep trying. The assumption is Trump will continue to use trade and China as a means by which to motivate his political base as opposed to developing a set strategy. 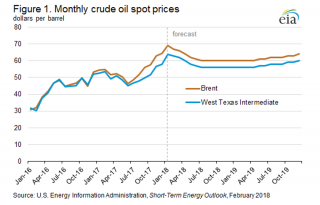 There are claims U.S. oil producers can make a good living at $50 a barrel and others assert that nobody can profit until those per barrel prices are over $80 or even $90. The fact is that fracking oil is very different from one location to another. A shallow pool will yield more cheaply than a deep one, but a deep one may have a longer life span and yield more in the end. The U.S. no longer roots for lower and lower oil prices—at least U.S. producers don't. The majority of us are quite happy with these low prices, but it takes some of the wind out of the sails for the U.S. economy when they are this low. The latest reading from the Purchasing Managers' Index (PMI) was better than expected after the slight dip that had taken place the month before. Instead, the index reached a high of 59.3 after having been at 57.7 prior. The prime motivation for this increase in activity was the rush to get production in place prior to the arrival of more tariffs and restrictions. The threat of tariffs and other trade impositions has been the most important motivator for expanded imports and to some degree the expansion of the economy as everybody has been trying to beat the deadlines by producing as fast as they can. This has essentially defeated the whole purpose of the tariffs and trade threats as it has meant a wave of imports as business seeks to keep their costs in line and preserve their supply chain. The attention of the U.S. has been on opioid addiction and rightly so given the economic impact. The rest of the world is still struggling with alcoholism. The threat has been escalating as people become more and more desperate for the impact. In Eastern Europe, people are drinking hand sanitizer and mouthwash to get that buzz. In Latin America, people buy pure ethanol and mix it with Kool-Aid or Coca Cola and hope they get the measure right so it doesn't cause immediate and catastrophic liver failure. The crisis is one of poverty and the lack of options for much of the population. It leaves these nations with huge public health costs. The European Union (EU) has been deeply disturbed by the antics of the U.S. President and now aims to take advantage of some new leverage. The euro was trying to be a rival to the dollar as a reserve currency a few years ago, but that was before the problems with recession and the collapse of the PIIGS (Portugal, Italy, Ireland, Greece and Spain). Now the EU is going to try this again with a strategy that aims to get the euro used in some highly important strategic sectors such as energy, commodities and aerospace. Not that Europe wants all the burden of being the reserve currency, but President Trump's attitude worries them. The connections between climate change and poverty and immigration are no starker than in Somaliland. This split off from Somalia has been in the grips of a drought that has killed 70% of the livestock and sent millions to seek work. The largest population of migrants in Germany has been Somali. It is that time of year. Along with all those sales, there is the annual rite of economists as they bravely try to assess what is to come in the next year. This is always just a little foolish as there is really nothing different about moving from December 2018 to January 2019. It is pretty much the same process as moving from May 2018 to June 2018, but we like the feeling of a year changing. It seems to have all kinds of significance that should be commented upon, whether it really does or not. There is slightly more curiosity about this year's transition as there has been a political change in the U.S. that will likely have an impact on economic issues. There are similar changes taking place in other nations as well. These will also play a role in the U.S. economy. Analysis: In the broadest of terms, the 2019 economy is expected to be less robust than it was in 2018. There will be less stimulus to work with and some of the chronic concerns and problems are likely to be far more troublesome than they have been. There are also big concerns building over some of the policy positions staked out by the Trump administration. Most of all, there is more fear of uncertainty than was the case in 2018. That is saying quite a bit as many felt uncertainty was at a pretty high level already. Few are expecting a dramatic collapse or devolution into recession—at least not at first. Those who assert recession is a possibility are expecting a short and sharp decline that would likely take place towards the end of the year or early in 2020. Much of the timing of a downturn will depend on the actions of the Fed. These actions will depend largely on the way the global economy behaves next year. Many of the factors that will affect the 2019 economy will manifest as the year goes on, but there are some that can be anticipated already. At the top of most lists is trade policy. There have been a lot of starts and stops; it has been hard to determine just what the agenda is. There has been a significant disconnect between the rhetoric and actions. The steel tariffs have been a case in point. In the beginning, they were to apply to all nations that exported steel to the U.S. Then the tariffs were lifted on all nations other than China, Russia and Japan. A few weeks later, the tariffs were imposed on everybody again and a few weeks after that the tariffs on steel from South Korea and Brazil were lifted (they are the No. 2 and No. 3 largest exporters to the U.S.). Now there is talk of exempting both Canada and Mexico again. They are No. 1 and No. 4. The steel sector has no sense of whether it will be protected or not. The response has been to jack up prices as far as the market will bear in anticipation of the tariffs being lifted again. This same sort of start and stop has been characteristic of trade talks with China, Europe and nearly everybody else. The business community doesn't react well to this level of inconsistency. The other major factor as far as the 2019 economy is concerned is the overall pace of global growth. It is slowing at a pretty rapid rate. This slowdown includes the U.S. as most expect the rate of quarterly growth to slip back to the levels common for the last 10 to 20 years—somewhere around 2.5%. This is not bad growth, but it is not swift enough to offset big problems with debt and deficit. The growth this past year came at a cost as far as both are concerned. The tax cuts that bolstered the economy also robbed the government of revenue. Rather than cut spending to reflect that reduction, the choice was made to borrow more, which has led to the U.S. paying out close to $300 billion in debt service every year. If the U.S. is slowing to old patterns, other parts of the world are slowing even more with China falling to 6% growth (recession territory for them), Europe struggling to see even 1% growth and countries like Japan and even Germany facing negative growth numbers. The U.S. remains as dependent on its export sector as any other major global economy. In a given year, it accounts for over 15% of the national GDP, an even larger percentage than is the case for Japan. The U.S. economy will be hampered to a significant extent by a slowing global economy. Some of this slower pace of growth can be attributed to the anti-trade policies. What Really Happened With China? It is true that diplomatic releases are often left vague and noncommittal given the fact that most talks are ongoing, but the outcome of the discussion between the U.S. and China has been especially murky. Both sides have declared victory to some degree. President Trump and Xi have been describing the deal as a good first step, but several days after the agreement was supposedly made, there have been precious few details and both leaders are contradicting each other. Analysis: Trump asserts China has agreed to lower tariffs against U.S. cars, but China has yet to issue any such deal. The U.S. indicates China has 90 days to control the theft of U.S. intellectual property and to halt efforts to acquire technology from the companies that do business in China. China asserts the 90-day deadline is just over talks and no trade restrictions are implied. The U.S. talk has been tough, but so has China's commentary on the supposed deal. The main tangible aspect of the deal has been the decision by the U.S. to not impose the additional tariffs that had been scheduled for the start of next year. These have not been eliminated, but they are off the table for now. It seems both nations are doing their best to leverage their positions. The U.S. is currently getting hit by higher consumer prices, but China has the most to lose in the longer run. The fuel tax is now being seen as the final straw. There have been many changes to the French tax system and many new developments within the labor market, but the additional tax on already expensive and heavily taxed fuel was the final insult and the riots ensued. Granted, the majority of the protests have been peaceful and the violence has been blamed on extremists from the right as well as the left. The point is that tens of thousands of people have been hitting the streets over this issue. Yesterday, the government of Emmanuel Macron did what it said it would never do—back down. The plan to raise the fuel prices has been shelved for the time being although most of the other tax reform efforts are still in place. The protestors are taking aim at them as well. Analysis: Macron promised much of this reform effort when he was running for office. There was an assumption that he had considerable support for the plan, but that was a somewhat inaccurate assessment of his victory. The majority of those who voted for Macron were really voting against Marine Le Pen and the National Front. They were not all that enamored of Macron or his policies, but they definitely did not want to see Le Pen in charge. The tepid support for his plans has not stopped Macron from pushing them, but it is not clear he has the support and allies he would need to get them through the National Assembly. The tax plan has been studied by a variety of think tanks and groups that assert a middle-of-the-road approach to their analysis—neither supportive of the left or the right. They have concluded that the most pressure has been added to the population in the bottom fifth as they have lost tax breaks and are now expected to pay more tax overall. The biggest of the tax breaks has gone to the wealthiest in society through the elimination of the wealth tax. As these tax plans roll out, the majority of the population will benefit as there will be changes in how business handles social security payments. The convoluted housing tax is slated to disappear and there will be pressure on retirees with larger incomes. Most of these are reforms analysts have been supporting for years and for sound economic reasons, but that hardly matters to the people seeing some tax break vanish or those being expected to pay more. The taxation of the wealthier retiree has been unpopular as it is seen as punishing people for having been frugal. The tax on fuel was designed to get people to use more mass transit and to steer them in the direction of electric cars and other more efficient transportation options. The problem is that transit is not always an option. Many argue that high fuel prices discriminate against those in rural areas. Now that Macron has been rebuffed on this issue, there is a sense that he can be similarly intimidated when other tax issues come up. The Organization of Petroleum Exporting Countries (OPEC) is not the all-powerful cartel it once was. The latest move within the ranks of OPEC illustrates this. After several years of attack from other OPEC members, the leaders of Qatar have concluded they are better off on their own. Saudi Arabi has led the opposition to Qatar, but has been joined by members such as the UAE, Bahrain and Egypt. The leaders of these nations assert Qatar has been supporting and fomenting terrorism, but the evidence of such collusion is flimsy at best. Their major crime has been to contradict the Saudi positions on everything from Yemen to Israel. The country is now one of the largest exporters of liquefied natural gas. It also hosts the largest U.S. military base in the region. Analysis: The dispute comes at a time when the very structure of OPEC is creaking. There have always been vast differences between the members as some are very rich and others not so much. The policies that favor the richer members are fought by those from Venezuela and Nigeria as well as some of the other cash-strapped members. The leaders in Qatar have asserted their enemies circulate the stories of colluding with terrorists as a way to try to separate them from the U.S. The opinion of the U.S. military has been that some factions in Qatar support the terrorists, but that the government as a whole does not. Russia has become more important to oil policy than any in OPEC other than Saudi Arabia. That likely provoked the Saudi leadership to get even more aggressive toward the U.S. Nothing all that substantial will change as a result of the split, but it underscores the assumption that this trade pact doesn't carry the same weight and influence it once did. Now the big supply conversations involve the Russians and the Saudis, but they both have to keep an eye on the output coming from Australia. The majority of us do not lead every conversation with a litany of our woes. For the most part, we keep our tragedies and trials to ourselves and to a small circle of friends and relatives. I am the exception it seems—by dint of the fact I write this publication. I know that some among the readership have an interest. I can only beg patience from those who are not so inclined. One thing I have noticed as I share the trials and tribulations of life is that there are so many people suffering these same challenges. I was astonished at how many people's lives have been touched by cancer with most going through far more than I did. Now I am seeing how many people have had to deal with the untimely deaths of loved ones. I have known these people for many years and never knew their story. It seems that we all have these tragedies and we have all had to find ways to grieve and then move on. I have always thought I was an empathetic person, but now realize that one can't really understand until one has been in that situation. I now look at people a little differently as I wonder what they have had to endure. I marvel at how people are able to handle all that is thrown at them. It is always a little fascinating when forecasts for something like oil follow some kind of flat and calm prediction offered right on top of years of volatility. It should be apparent to anyone that oil prices move around a great deal and are affected by a wide variety of factors—everything from good old supply and demand to geopolitics and the weather. The message to take from this chart is that overall prices are not expected to deviate much from where they have been in recent months. The view is that oil will be in a range between $55 and $65 a barrel (unless one of those motivators plays an unexpected role). The most likely deviation-causing event would be political in nature—a decision by key producers to reduce levels of output.